Founded in Manchester in 1968, Barcrest is one of the most appreciated slot providers in the world. It’s definitely not the biggest or the most popular, but for true slot fanatics, Barcrest slots have always been a top choice. Originally Barcrest got famous for their classic fruit machines, such as Invader for example. 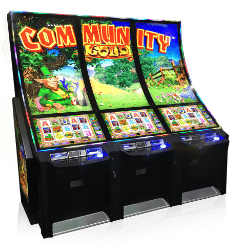 These day their range is much wider, from the original classic to new, high tech video slots. During it’s history, Barcrest was sold twice! First it was acquired by IGT in 1998. Then it was bought by Scientific Games in 2011. Suprisignly, the amounts it was purchased for were pretty low – just 35 million. We assume now it would cost much more. When launching one of Barcrest casino slots you will see WMS logo appear. Why is that? The reason is that WMS is another subsidiary of SG and Barcrest slots are brought online through WMS platform. If you check the top 50 loosest slots online, Barcrest would accommodate at least 10 spots with their special high RTP Big Bets feature (see the table below). Rainbow Riches slots, launched in 2006, is still one the most popular slots series in the world. Online and offline. In fact, the original Rainbow Riches is the #2 most played slot online in 2018, second only to Starburst. 200 of original Barcrest employees still work under Scientific Games umbrella. We assume that due to them Barcrest managed to keep their own chic and style, which we all love. Ooh Aah Dracula – 99% with Big Bet. 96% without. Sheik Yer Money –98.22% with Big Bet. 96.22 without. Dr. Jekyll Goes Wild –98.20% with Big Bet. 94.20% without. Cash Stax slot – 98.14% with Big Bet. 94.12% without. Golden Chief slot – 98.14% with Big Bet. 94.12% without. Monopoly Bring The House Down – 98.10% with Big Bet. 94.10 without.